NEWS FLASH: on May 4, 2017, Oklahoma Attorney General Mike Hunter filed eight felony charges and one misdemeanor charge (apiece) against Ryan and Richard Tate for alleged fraudulent business practices. For details, see my post: The Law Finally Catches Up With Tate Publishing & Enterprises. 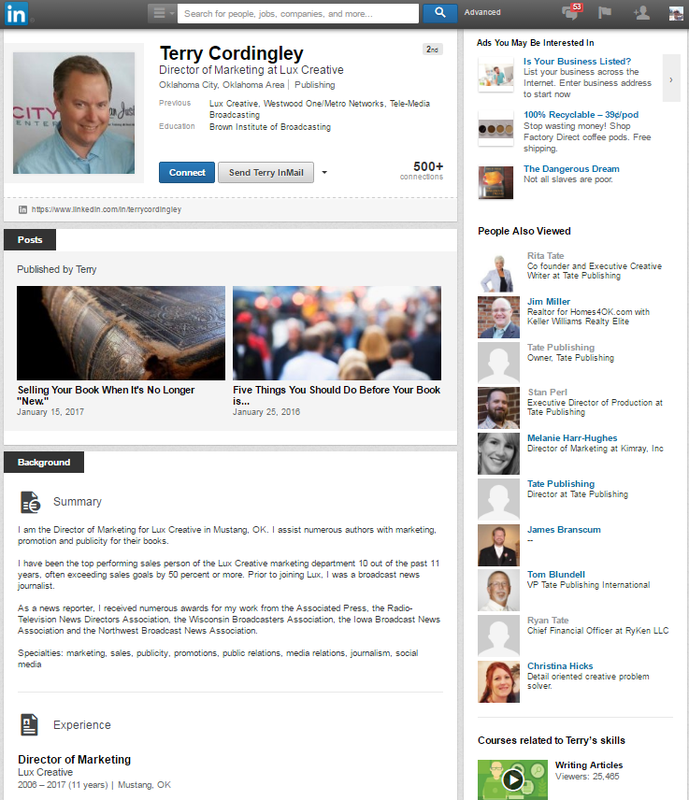 A summary of this extremely long post: so-called Christian vanity publisher stiffs authors, staff, and creditors; gets sued for millions of dollars and fails to show up in court; goes bust with no notice; rises from the dead to seek new victims, only for the founder and CEO to get busted. The tale unfolds in my initial post and the dozens of updates that follow. Readers of this blog may be familiar with Tate Publishing & Enterprises--an Oklahoma-based publisher that describes itself as "a Christian-based, family-owned, mainline publishing organization with a mission to discover and market unknown authors." 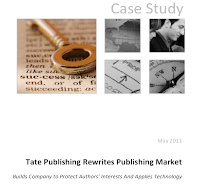 Tate takes pains to depict itself as a selective traditional publisher that accepts "only a single-digit percentage of authors who submitted manuscripts for publication" (a claim that's a little hard to credit from a publisher that, if Amazon is to be believed, pumped out 3,000 titles in 2015). 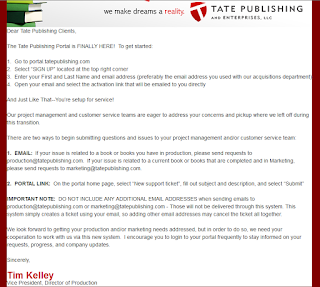 In fact, authors must pay nearly $4,000 to publish with Tate, with even more due if they choose to buy any of Tate's array of extras, such as "personalized author websites" and video book trailers. Tate also incentivizes author book-buying, by promising to refund the original fee once 2,500 books are sold and allowing author purchases to count toward the total--though only if made in bulk quantities of 300 or more. Now Tate may be in bigger trouble. 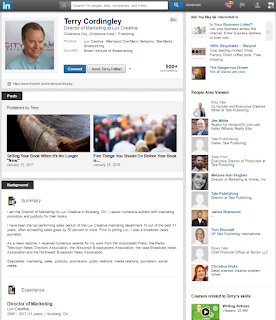 Xerox Corporation, which leases some of the equipment Tate uses for its 24-hour-a-day printing facility, has filed a $1.7 million lawsuit against Tate Publishing and Ryan Tate, alleging defaults on re-structured lease and service agreements and on a promissory note executed to address previous debt, and seeking re-possession of $450,000 in leased equipment as well as a money judgment of $463,786.90 against Ryan Tate personally, as Guarantor on the promissory note. The full petition can be seen here. That's not the only lawsuit Tate is fielding at the moment. One of its authors, Bat-Zion Susskind-Sacks, has filed suit for breach of contract, deceptive trade and marketing practices, fraud, and several other causes of action, alleging that she paid over $12,000 for a book that was published full of errors (twice) and never marketed. She's asking for her money back, as well as attorneys' fees and damages. Her amended complaint, which includes pages from her book showing the mistakes, can be seen here. Summonses in both suits were issued on the same day, May 27. Tate has 20 days to respond. Stay tuned. UPDATE 7/1/16: More trouble for Tate. 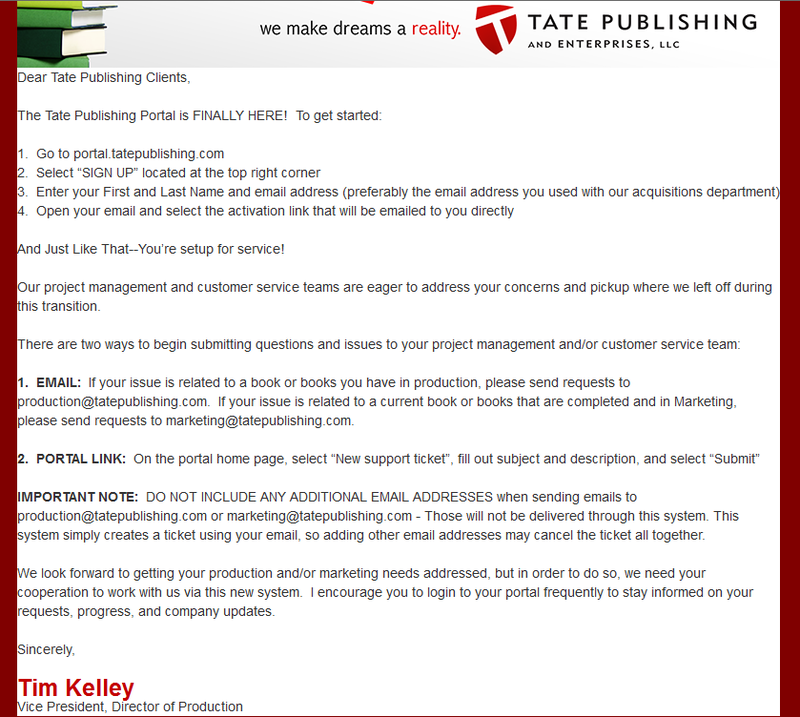 Local news station KFOR reports that staff have been laid off from Tate's printing plant, and author complaints of non-payment are surfacing (Writer Beware has received similar complaints). UPDATE 11/15/16: Per the most recent updates to the court docket, plaintiff Xerox has successfully re-possessed its equipment, but retained a cause of action for lease amounts still due. It has also discovered additional debts that weren't included in the original complaint. Accordingly, it has filed an Amended Petition raising the total money amount it's seeking from Tate to $1.89 million. Meanwhile, the US Department of Labor has launched an investigation into Tate--an investigation that has spurred allegations of tampering from some Tate employees, who claim that Ryan Tate "coached" them on what to say. UPDATE 11/30/16: Nobody knows the troubles Tate's seen...oh, wait, everyone does. News Channel KFOR reports that three new lawsuits have popped up this month: one by a musician suing over copyright laws (a customer of Tate Music Group, which also runs on a vanity model); one by memorabilia manufacturer Jostens, which claims that Tate owes it more than $13,000; and one by the property company that leases Tate its print shop (vacant now that Xerox has re-possessed its equipment), which claims that Tate owes nearly $20,000 in rent. My book was ready to be printed so I made some serious attempts to convert the PDF to Word. Impossible. Tate uses a type of PDF called Acrobat reader DC and is proprietary to Tate. I have been doing a very slow page by page copy and paste finding out they have hidden tabs, margins, font and spacing. It takes about an hour to do one chapter that is presentable to my new publisher in Word 2010. Going through the copy and paste I find out I have 2 Chapter One's and several with no chapter numbers. After doing 5 chapters I found over 300 errors so the book wasn't worth printing any way. They use a Philippine font that is hard to change when you do a copy and paste. FOR FURTHER UPDATES ON TATE PUBLISHING AND THE LEGAL PROCEEDINGS AGAINST RICHARD AND RYAN TATE, SEE MY MAY 4, 2017 POST. I've been getting some questions about the BookLife Prize in Fiction, a new award for unpublished and self-published novels. Prizes include a "brief critical assessment" from Publishers Weekly reviewers for all entrants (BookLife is owned by PW), a book blurb from "a bestselling or award-winning author" for semi-finalists, and a grand prize of $5,000 for a single winner. BookLife claims to "[tap] the experience, integrity, and authority of Publishers Weekly to help indie authors achieve their goals." It offers a free submission portal for writers who want to submit self-published books for review, along with "editorial content—success stories, interviews, author profiles, how-to pieces, news, and features". There's also a Service Directory, whose DIY entries--some of which are paid ads--are subject to restrictions via BookLife's Terms & Conditions, but otherwise appear to be unvetted. For instance, there are listings for Strategic Book Publishing & Rights Agency (on Writer Beware's Thumbs Down List and long the subject of an Alert on Writer Beware) as well as SBPRA's "marketing" subsidiary, Author Marketing Ideas. As "endorsed" listings, they receive preferential placement. Problem is, in both cases, the "endorsements" are from SBPRA employees. I've been skeptical of BookLife since its inception, in part because of the failings of the Service Directory, in part because much of its content is generic info widely available on the web, or else reprints from industry bloggers or PW itself. Also, although BookLife is free, the site promotes PW Select, which charges $149 for a listing in PW and "featured" presence on BookLife. With its multiple judging rounds and the participation of PW reviewers and editors, BookLife's Prize in Fiction is reminiscent of Amazon's (now-discontinued) Breakthrough Novel Award, which was also done in partnership with PW--though the crowdsourcing element is missing (judging in the ABNA was partly based on votes from the public), and there's no publication offer waiting for the winners. There's another difference as well. 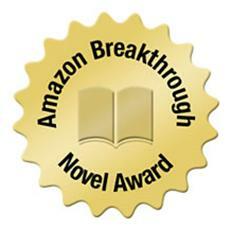 Entering the Breakthrough Novel Award was free. Entering BookLife's Prize in Fiction requires a whopping non-refundable entry fee of $99. A big entry fee like this, as many of you know, is one of the signs of an awards profiteer--an organization that runs writing awards and contests not to honor writers but to make a buck (I've written a lot about such organizations on this blog). So I contacted BookLife to ask why the fee was so high. I quickly heard back from BookLife President Carl Pritzkat, who confirmed what I suspected: part of the fee goes to cover honorariums for the PW reviewers who'll be providing the critiques. But he also told me that "in terms of the entry fee we were modeling it after prizes like Forward Magazine's INDIES ($99 with an early-bird rate of $79), IndieReader's Discovery Awards ($150 for the first category of entry) and IBPA's Benjamin Franklin Awards ($95 per category for members; $225 for non-members)." I don't suspect BookLife of being an awards profiteer. Apart from the huge entry fee, other warning signs aren't present. But honorariums or no honorariums, $99 is a lot of money, and in light of the large number of cynical awards schemes that seek to profit from aspiring and self-published writers' hunger for recognition and exposure, I have to wonder why BookLife would choose to model itself after IndieReader and its ilk. The grand prize is a nice chunk of change, and given how much writers have to struggle to obtain worthwhile feedback, author blurbs and reviewer critiques are certainly tempting. But I'd suggest that writers who are considering this contest do some serious thinking about whether it's worth handing over nearly $100 for a few sentences of feedback and the slim possibility of winning $5,000. [You g]rant BookLife and its affiliates a royalty-free, fully-paid, unrestricted, worldwide, perpetual, irrevocable, nonexclusive, sub-licensable and freely transferable right and license, for all formats and media, whether now known or hereafter devised or discovered, to use, reproduce, modify, edit, adapt, publish, translate, create derivative works of, distribute, perform, publish and display (in each case, in whole or in part) Your Materials, including without limitation any ideas, concepts, methods, systems, designs, plans, techniques or other similar information included therein, and/or to incorporate them in other works. BookLife solicits authors and publishers to upload copies of their books for review and promotion. The terms of the license specified above shall not apply to such works, and authors and publishers shall retain all rights to their works except as may be expressly agreed and except for reasonable fair use rights granted to BookLife in connection with the review and promotion thereof. "Fair use" can be a murky concept, but my guess is that it's intended here to cover quotes and descriptions that may be used in reviews and in the profile of the winner that's part of the prize. I don't often post about personal stuff here. But I wanted to let you all know why I vanished abruptly at the beginning of May (which is also why, for the past couple of years, this blog has been idle for weeks at a time). 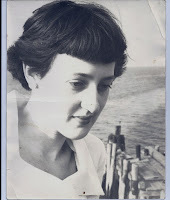 My mother, Alice Fellows, died on May 14, after a long illness. Who was my mother? There are many ways I can answer that question. 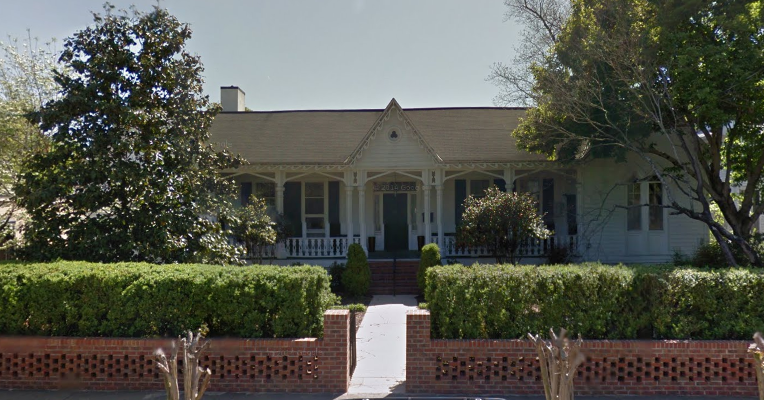 I can say that she was born in Tuscaloosa, Alabama in 1926 (or possibly 1928--she was famously cagey about her age) in a house that is now on the National Historic Register. That she attended Hudson Strode's famous creative writing class while at the University of Alabama; that the novel she began there, Laurel, was published by Harcourt Brace when she was just 22, to praise from the New York Times and Kirkus, among others. That, eager to escape the South, she moved to New York City in the early 1950s to attend graduate school at Columbia University, where she met and married my father. That in the succeeding years she gave up writing fiction, but earned a masters degree and did much of the work for a PhD. That when my parents divorced in 1977, she moved back to New York and, not having held a job for more than two decades, landed a secretarial position at a publisher and eventually worked her way up to Senior Editor with Frommer's. That in her later years she returned to fiction writing, completing a historical novel about the Jacobite uprising of 1745. I can say that my mother was one of the most intelligent people I've ever known, and also one of the most stubborn, independent, self-absorbed, secretive, and fearless. That she loved to travel more than anything (in her 70s, after retiring from Frommer's, she landed her dream job: freelance travel book writer). That for most of my life she was my closest friend, the person I could share everything with and tell anything to, my best-of-all-time movie-museum-concert-shopping buddy. That she never really forgave me for writing genre fiction ("When are you going to write a real novel? "), but even so was my go-to beta reader, with a sharp editorial eye that shaped all my books. 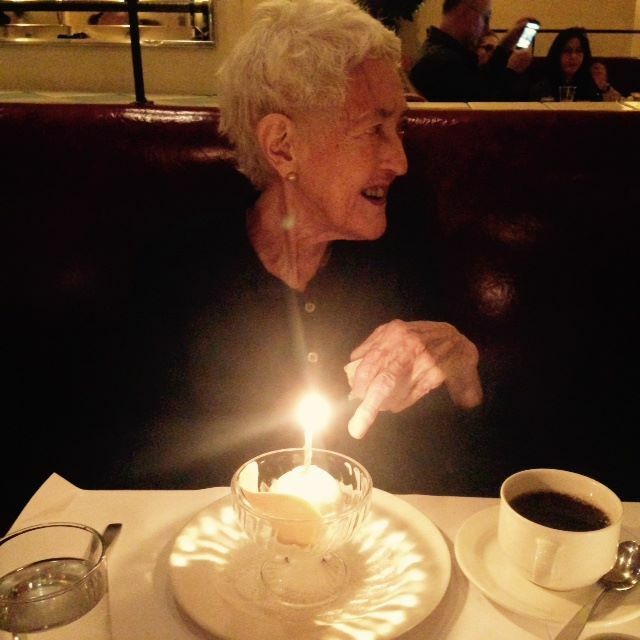 That I regret the semi-estrangement that grew between us in the last decade of her life, as she became increasingly obsessive and bitter about the state of the world and the indignities of aging--and more and more angry with me for the worry I couldn't hide about her obviously declining health. I tried once to tell her that the people who love you are going to worry about you whether you want them to or not, and you really need to just forgive them. She didn't want to hear it. I can say that her final illness--a diagnosis of Stage 4 cancer in 2013--changed everything (our semi-estrangement vanished as if it had never been) and nothing (see stubborn, independent, self-absorbed, and secretive, above). This nearly three-year ordeal was extraordinarily difficult not only for her, but for family and loyal friends, as we banded together to make it possible for her to go on living independently in her home, as she wished. Because we honored her, we honored her decisions, even where we felt they were bad ones. Not until the very last week of her life, for instance, did she finally yield to our pleas to accept in-home and hospice care. I can say all these things. But they don't really add up to a picture of my mother, or help me figure out how I feel now she's gone. I'm sure that many of you reading will be familiar with the tangle of relief and grief that comes at the end of a loved one's drawn-out illness, especially where there is suffering. I still catch my breath every time the phone rings. When I forget that her struggle and ours is over, I'm still stalked by the worry and dread that, over the past three years, have been my daily companions. I do know that I am not yet able to imagine the world without her. In my mind she's still in her New York apartment, reading or writing or researching, attending operas and concerts and dance recitals, going to lunch with friends, planning that trip to India she always wanted to make--living a life that was lone but not lonely, always full, and always, always on her own terms.